If you've been following the rest of this blog series you should be at the stage where you've written a (very) simple subroutine, but you haven't actually tested it yet. This article explains how to run your code as a developer to test that it works. Once you've run a macro, you can't use the Undo tool to reverse the actions that it has performed. There is always the possibility that your subroutine will crash the application when you run it so that you lose the code you've written. 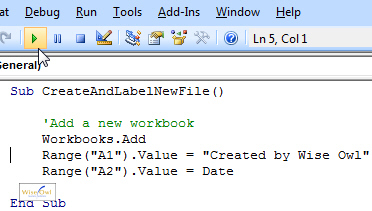 You can choose to save your code either in the VB Editor, or in the Office application you are working in. 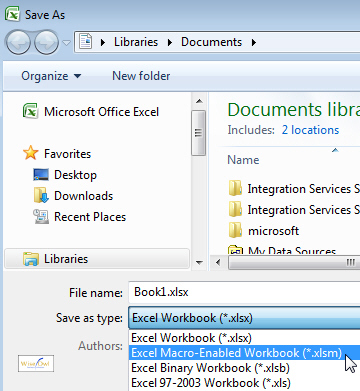 Technically you are only ever saving an Office document - the VBA project simply sits inside the file in the same way that a worksheet sits inside a workbook. If this message appears, don't click the Yes button! If you do that your macros will be deleted and the file will be saved. Click No instead and choose a different file type, as explained below. Each Office application has a set of file types that can be used to save your code. If you clicked No on the message shown above, you'll be taken to the Save As dialog box where you can choose one of these file types. The diagram below shows part of the list of file types you can choose from in Excel 2007. 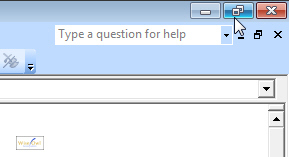 Click on the Save as type: option to select a different file type. Press F5 on the keyboard. From the menu, select: Run -> Run Sub/UserForm. Click the Run Sub/UserForm tool on the toolbar, as shown below. The Run tool looks like a green triangle pointing to the right, like the play button on a DVD player. Wise Owl does not recommend the use of crossed fingers, lucky four-leaf clover or prayer when running subroutines. In our experience it doesn't help and encourages sloppy programming. If nothing went horribly wrong and you didn't see any error messages you can now switch back into the Office application (ALT + F11) to see if your macro worked. Success! It's surprising how satisfying it can be when even a simple macro works first time. If you were unlucky enough to have something go wrong when you tried to run your code, the next article in this series will give you a few pointers about how to go about identifying and fixing the problem. At the top right hand corner of the VB Editor is a set of three buttons. Click the middle one of these to shrink the window down so that you can see the Office application in the background. Once you've restored the VB Editor window, you can click and drag on the border of the window to change its size, and click and drag on the title bar of the window to move it around the screen. Click into the subroutine you want to run in the VB Editor. Press F8 on the keyboard to start the subroutine. Press F8 to run the line of code that is highlighted in yellow - continue doing this until the subroutine ends. Press F8 to run the line that is currently highlighted in yellow. Carry on doing this until you have run the End Sub line. Take care that you don't keep pressing F8 after you have run the End Sub line. If you do, your subroutine will start again at the beginning! If you get bored of stepping through a long subroutine, you can always press F5 at any stage to run the rest of the code, or click the Reset tool (it's the one that looks like a little blue square) on the toolbar to stop the code running. If you're writing a set of subroutines that you want other people to be able to use, you don't want them to have to go into the VB Editor and find the right macro. There are many other ways to run macros, including assigning a shortcut key to them, or attaching them to buttons, pictures or toolbars. These separate Wise Owl blogs explain how to do this in more detail. In the words of the famous guide book, "Don't panic!" There could be a huge number of things that have gone wrong when running a subroutine. The next article in this series talks about some of the most common mistakes people make when writing and running VBA code.